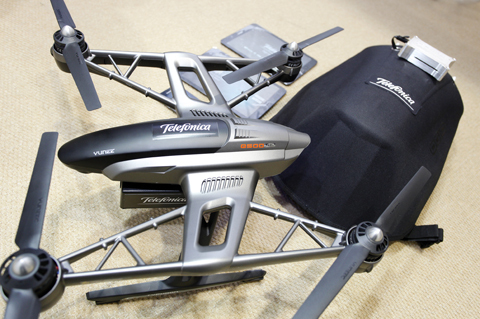 The popularity of drones and balloons have made it possible to try and come up with innovative solutions for providing connectivity, surveillance and many other use cases. I have talked in detail about the UK operator EE's attempt to use Airmasts (which are now called E.M.M.A. - Emergency Mobile Mast Aid) and connect rural Scotland using Drones and Helikites. 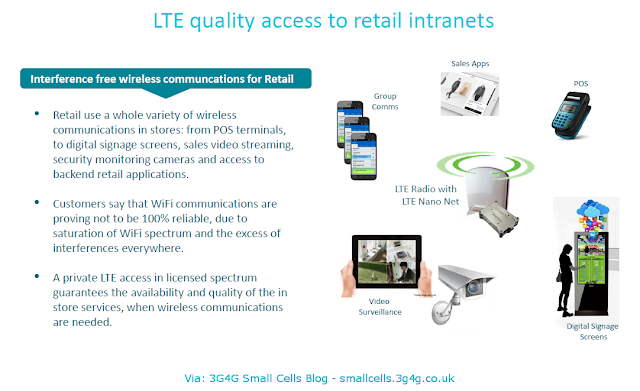 In my Small Cells at MWC report, I talked about how there were many operators, vendors, etc. showing different things they were doing with drones and recently in my posts talked about Verizon's 'flying cell-site' and AT&T's 'Flying COWs'. 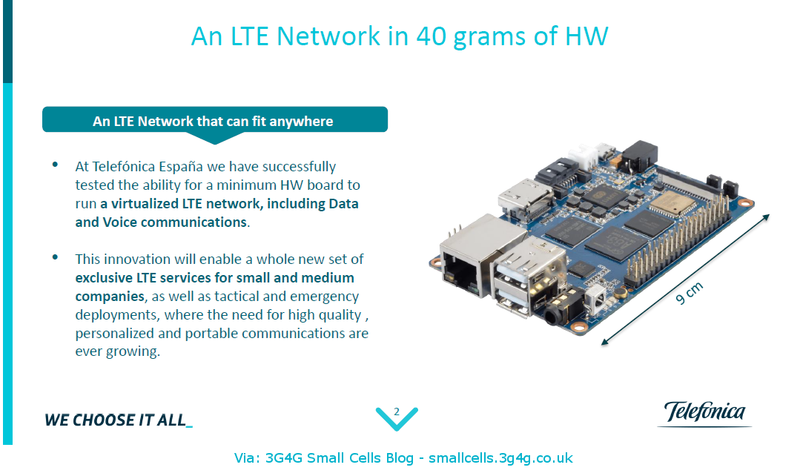 I only looked briefly at Telefonica's announcement about the LTE Nano. The most eye catching use of LTE Nano is for the rescue teams. 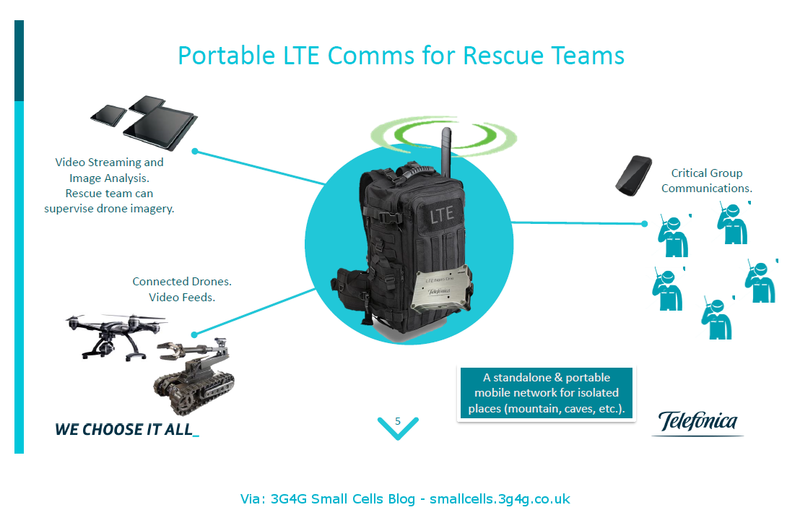 An autonomous and portable LTE solution in a backpack, providing critical LTE communications in isolated places with no pre-existing coverage and difficult Access. 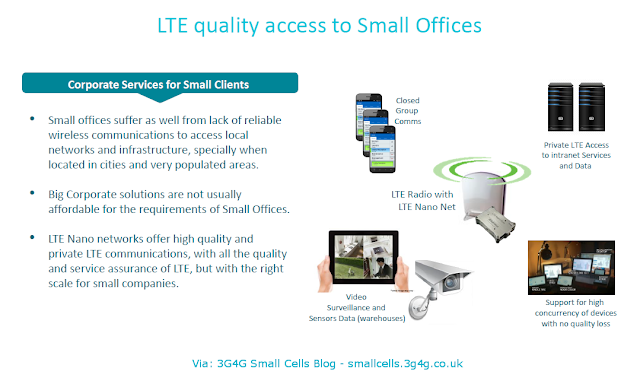 private LTE communications for small offices. Here I remain to be convinced that this scenario will not be superseded by WiFi calling, etc. McAdam has so far decided that his company will follow a 5G strategy of adding many thousands of small cell sites in major urban areas, instead of relying just on the big cell towers it used in the past, and then connecting them with fiber optic cables. On Tuesday, Verizon announced a new deal to buy at least $1.05 billion of fiber optic cable and related hardware from Corning over the next three years–enough to cover 12.4 million miles, the companies said. Verizon already has 13,000 small sites deployed, McAdam said, disclosing the total number for the first time, compared to about 60,000 current cell tower sites in its network. But Verizon will be adding in each major city 8,000 to 10,000 more small sites, tiny transmitters that can fit in the palm of a hand and be tacked onto a lamp post or traffic light pole. Unfortunately, according to McAdam, the fiber networks that cable companies have installed don't have nearly enough capacity to meet Verizon's needs to connect all the small cells in big cities. While a typical fiber cable may have contained 144 separate strands of glass wiring in the past, Verizon's newest installations in Boston have 1,700 separate strands per cable. Their VP of network, Mike Haberman earlier said in Fierce Wireless: Verizon is increasingly looking to small cells to increase capacity and improve network performance, particularly in urban areas. Small cells are complementary to more traditional macrosites, Haberman said, enabling carriers to fill in small gaps and transmit more data in areas where towers may not be sufficient. In Nebraska, the city of Lincoln inked a 20-year lease agreement with Verizon in December to install more than 100 small cells on light poles. The deal calls for Verizon to pay a $1,500 permit fee, and $1,995 per pole, per year. The per-pole rent jumps 2.3 percent each year, meaning Verizon will pay more than $3,000 in the final year of the agreement. Plans by Verizon Wireless to strengthen and modernize wireless data service in Sioux City took a major step forward Monday, as the City Council granted approval to site plans for 11 small cell poles. FiberComm LC, a Sioux City telecommunications company with an extensive fiber optic network, will build and maintain a dozen of the 35-foot poles, each of which will be capable of accommodating two cell phone service providers. The 12th tower had previously received the green light from the council during its Feb. 27 meeting. Pole locations will include strategic spots throughout the city, including near the Hard Rock Hotel & Casino, the Tyson Events Center and UnityPoint Health -- St. Luke's hospital. "Many of these areas are where there is very poor coverage," Jeff Zyzda, FiberComm's director of operations and engineering, told the council Monday. "Also many of these areas are areas where there are events and high traffic." Verizon is also demoing 5G in Washington and at the same time lobby for the access to city's poles. 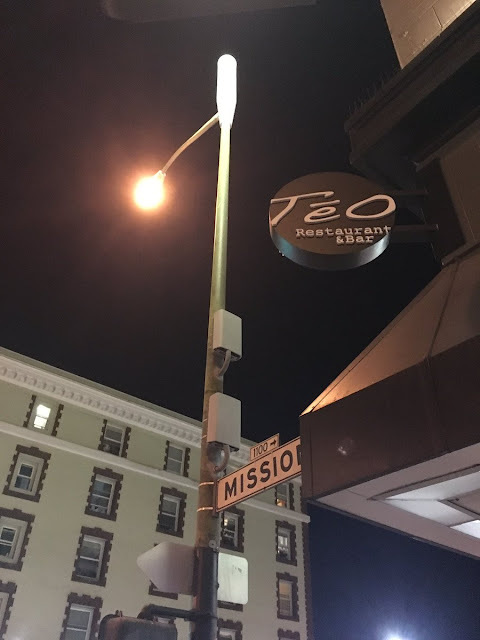 To make that 5G simulation a reality someday will take hundreds of thousands of new, smaller, cell phone antennas all over the urban landscape. And that’s why the Verizon 5G bus came to Washington’s Capitol. The wireless industry hopes to revive legislation that would preempt local zoning rules in order to fast-track placement of the new network of antennas. Verizon’s Gordon Cook showed off one of these antennas. Cook said Verizon wants to strap 5,000 to 6,000 of these boxes onto street poles in Washington in the next few years. First they’d be used to augment current 4G service. Eventually they would be swapped out with 5G antennas. “We want to be able to put these up quickly and to serve more folks with them and bring higher quality data services to people,” Cook said. But Cook said current local zoning rules are an impediment. City officials have fought back saying they want some control over how and where small cell antennas are placed. In addition to all of the above, Verizon has been testing drone based 'flying cell-site' for emergency or disaster scenario, using small cells to connect indoor DAS and thinking about the possibility of deploying small cells in 3.5GHz CBRS bands. Most people outside the UK will not realise that there is a 'City of London' which is a city inside London city. Anyone interested in learning more can quickly get up to speed by watching this YouTube video. The City of London is also colloquially known as the 'Square Mile'. The City of London Corporation has announced a deal that will deliver a free, public access WiFi network, offering internet access anywhere within the Square Mile. The multi million pound project is one of the largest investments in wireless infrastructure ever seen in London. Cornerstone Telecommunications Infrastructure Ltd (CTIL) has been awarded a major 15-year contract to roll-out and manage the City of London’s new wireless network in conjunction with O2. The new network will deliver wireless services across all mobile networks for City businesses, residents and visitors. CTIL will partner with O2 in building the WiFi network which will be free for the public to use. The project will replace the current service provided by The Cloud and will be fully operational by Autumn 2017. The network will be more technically advanced than those found in other leading global financial centres, including New York. State-of-the-art equipment will provide speeds and see users able to enjoy high bandwidth services like video-calling and video on demand over free City WiFi following a one-time only registration. For those who may not know, there are 4 operators in the UK. Vodafone & O2 jointly own CTIL who provides them the passive infrastructure while EE and Three own MBNL for the same purposes. This is a very ambitious ask by the City of London. Only time will tell how far they will succeed. Backhauling problems driving up deployment costs? 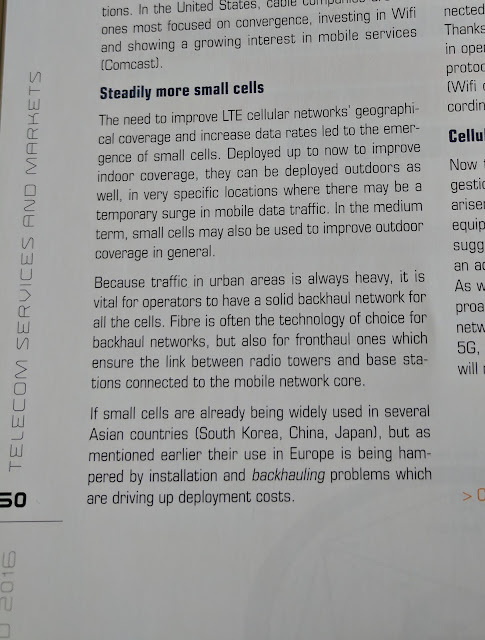 Going through iDate Digiworld Yearbook 2016, I came across this section on small cells. What caught my attention was the last sentence stating that in Europe, small cells deployments are "being hampered by installation and backhauling problems which are driving up deployment costs". While this is generally true, there are ways around it when it comes to coverage rather than capacity. When small cells are being used for capacity, there needs to be a high throughput backhaul. Where capacity is the main reason, its generally time and cost which is of essence. I have talked about how in-band backhaul (IBBH) could be used in case of providing rural coverage and emergency / temporary communications. I get asked about IBBH many a times. A simple way to explain would be to use the diagram above. If the operator has enough spectrum, the macro layer (frequency f1) can provide backhaul to a small cell that transmits on another frequency (f2). This way there is no interference between macro cells and small cells. In case of in-band backhaul, the small cell would be transmitting at the same frequency (f1). Here, managing interference between macro cell and small cells is the biggest challenge. Even though I have shown mesh links in the pictures above, its not a must. It just provides flexibility of expanding the coverage further in case the macro connectivity cannot reach other sites. IBBH is not just a cheap option for backhauling, it also allows very quick deployments. I have seen sites go up within a few hours based on this option. While not perfect, it is a good compromise for extending the coverage. Small Cells: Best solution for rural coverage?